The Decline in Saving: A Threat to America's Prosperity? The Decline in Saving: A Threat to America's Prosperity? "The Decline in Saving" provides an extensive and unparalleled account of the complexity of present saving patterns, an issue made even more serious by the 2008?09 global economic and financial crises. 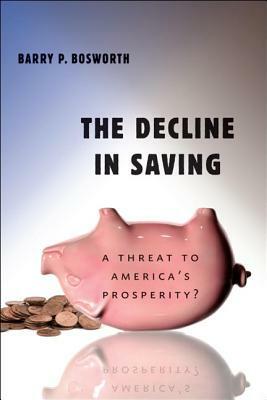 It objectively examines saving at both the individual household and the aggregate economy levels to understand whether the U.S. decline in saving is truly a threat to American prosperity. ""The magnitude of the two-decade-long fall in household saving has been truly astonishing; it is even more surprising in view of the fact that the large cohort of baby boomers should have been in their peak saving years." "If Americans save so little, why are they so rich? This divergence emerges because the conventional measure of saving excludes all forms of capital gains...."
"Saving behavior appears to be influenced in important ways by country-specific institutional factors along with a few common determinants, such as income growth, demographic changes, and variations in private wealth." "In the aggregate, the United States has had a negative net national saving rate since the onset of the financial crisis, and it now relies on foreign resource inflows to finance all its capital accumulation and a portion of its consumption." "The optimistic projections of just a few years ago about the future well-being of retirees now seem seriously dated." Title: The Decline in Saving: A Threat to America's Prosperity? Author Name: Bosworth, Barry P.